As horses have lost their prominence as a transportation option, a Christmas tradition is getting more difficult to find. FAIRFIELD — Steve Lemieux is a man who works with stone and plays with horses. His passion for a rare breed of horse has led him to start a business based on the old-school winter experience of riding through the woods in a two-horse open sleigh, a cultural touchstone that a handful of writers from the 1800s have linked inextricably to Christmas. For 26 years, Lemieux has hauled rock as a mason, decades of outdoor toil that have contributed to his ruddy complexion and powerful frame. “In masonry, everything is heavy,” he said from his home, a 60-acre tract of land with well-groomed horse trails off Covell Road. But now, with untold tons of stone behind him, the masonry work is beginning to wear on Lemiuex’s 50-year-old body. Tasks that came easily a quarter century ago have begun to hurt. Lemieux grew up in Quebec, where his father bred Canadians, a type of horse listed as threatened by the Livestock Conservancy, an organization dedicated to saving rare breeds. Years after he moved to Fairfield, he was joined by Isabelle Lemieux, who came from Quebec shortly before their marriage. They speak French in the household. Lemieux drives his horses every day, sometimes at night, in sun, snow, or rain. “My neighbors think I’m crazy, out there driving in a snowstorm,” he said. He gets his mail on horseback. He even hunts deer from the back of his horse and says the horse’s body language indicates the presence of deer long before he sees them. 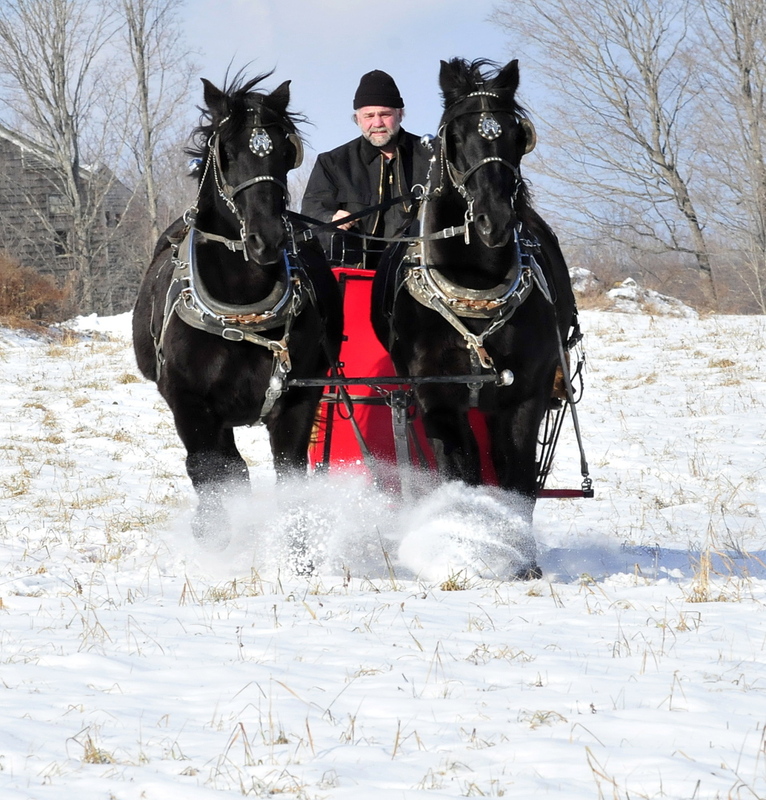 Two years ago, Lemieux decided to capitalize on his horsemanship skills and began Maine Horse Drawn Services, a business based on his ability to drive horses pulling sleighs, wedding carriages and wagons. In modern times, with cars having long ago supplanted the role horses play in daily transportation needs, horse driving skills are rare and getting rarer. The number of horses and ponies in Maine is declining, according to data from the U.S. Department of Agriculture, which showed a 5 percent decrease from about 12,700 horses in Maine in 2002 to about 12,100 in 2007, the most recent year on record. Lemieux said most of those horses are trained to be ridden, not driven, Lemieux said. “It’s become a lost art,” he said. When the Lemieuxes began offering winter sleigh rides, it revived a tradition that has been in short supply in central Maine. Last year, they gave 31 rides to 150 people. One was for Susan Burke, of Vassalboro, her husband Joseph and a group of more than a dozen members of Gardiner Nazarene Church. Burke described being warm and cozy, wrapped in blankets and enjoying the thrill of sliding quietly over the ground, sheltered from the worst of the wind by the thick woods. “It was beautiful and quiet,” Burke said. The trip was prompted when one church member, 90-year-old Dottie Mead, wrote a bucket list that included a winter sleigh ride like the ones she had enjoyed as a young girl. Burke said it was an experience she will always remember. But it’s also an experience that, as a group, Mainers have all but forgotten. Central Maine used to be at the center of a vibrant horse-drawn sleigh-riding scene, but it’s been more than 100 years since the activity was a necessary and practical means of travel. Nancy Porter, a Farmington historian, said the town used to be home to 15 or 16 sleigh-makers. Sleighs were critical to transportation in the winter, she said. The activity became identified as a wholesome Christmas activity largely because it was prominently featured in writings and songs by a handful of New England writers from that era. Sleighriding is also the focus of “Over the River and Through the Woods,” written by Lydia Maria Childs and first published in 1844, and “Jingle Bells,” written by James Lord Pierpoint and first published in 1857. Both Childs and Pierpoint were born in Medford, Mass., and both of the songs were originally associated with Thanksgiving, not Christmas. Even though sleighriding was once common at Thanksgiving time in New England, warmer winters have limited it to a shrinking slice of the year. Lemieux said the horses, like snowmobiles, need enough snow on the ground to pack and form a thick layer that won’t break too easily. In Maine today, it is rarely possible to drive a sleigh at Christmas, let alone Thanksgiving. “You have to have 10 times more horsemanship skill to drive a horse than you do to ride a horse,” Lemieux said. 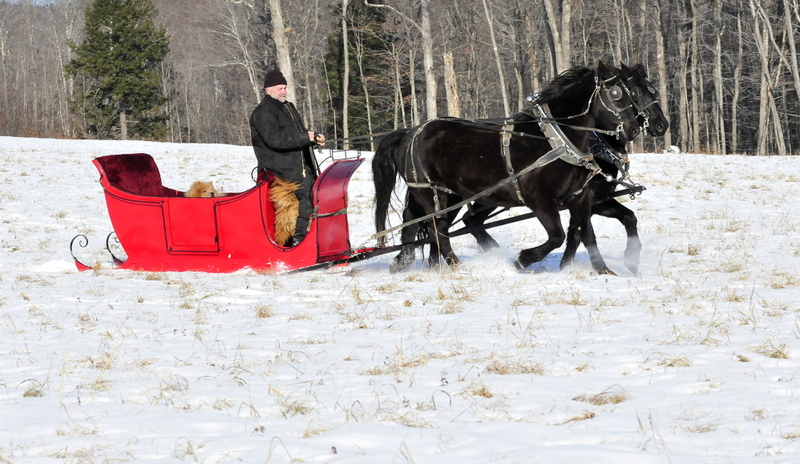 Winter sleigh rides are dependent on both horses and drivers trained in the delicate art of dragging a vehicle over the ground. Unlike in riding, when an unexpected sidestep is usually nothing more than an annoyance, driving requires constant concentration and precision. “When you’re driving, if you lose control of your horse, with a rider and a sleigh behind you, you end up with a wreck,” he said. The only way to meet the demands of driving horses, Lemieux said, is to have a strong ongoing relationship between horse and driver. “To have a good horse, you have to hitch him up three or four times a week,” he said. Lemieux works with his horses every day, alternating each night between his two teams of two horses. Occasionally, he’ll hook up both pairs at once, which he said is even harder. “Four in hand, not too many people can do that,” he said. There are a handful of people who, like the Lemieuxes, offer horse drawn sleigh rides to the public. Northern Heights Farm in Waterford, Hideaway Farm in Topsham, Rockin’ Horse Stables in Kennebunkport and High View Farm in Harrison all offer private sleigh rides and advertise minimum group charges of between $50 and $100. Rockin’ Horse Stables also advertises group rides on a set schedule for a per-person charge of $15 per adult and $5 per child. Others, including Chase Farms in Wells and Meadow Creek Farm in Sumner, offer sleigh rides but don’t have prices listed on their websites. The Lemieuxes charge $10 for adults and $5 for children, with a two-person minimum. Out in his barn, absentmindedly warding off an aggressive rooster with a raised boot, Lemieux called in a pair of his horses. They are Canadians, a horse breed that has strong links to the mid-1800s, the same era that sleigh riding became immortalized as a holiday tradition. Then, there were an estimated 150,000 Canadians throughout North America. Farmers liked the small, sturdy breed that was relatively easy to handle. And critically, Lemieux said, at 15 hands, or five feet tall at the withers, they are exactly the right size to be driven, hooking up nicely to sleighs, wagons and carriages. “We have the perfect-sized horse to fit that carriage,” he said. In the late 1800s, Canadians began to disappear from the landscape, and horse-drawn transportation went out of vogue forever with the popularity of the Model T Ford in the early 1900s. By 1976, there were just 400 Canadians left, according to the Livestock Conservancy. Today, the conservancy estimates their number at fewer than 5,000 and includes them on a list of seven threatened breeds. Lemieux got his herd of four from his father, Donald Lemieux, who bred Canadians in the small farming village of Saint-Gervais, Quebec, until he sold his farm last year. Horse breeders, mostly in Quebec, brought the heritage breed back from the brink of extinction. Each of his four horses has a different temperament. Hector, 15, and Tinoir, 13, were named by his father. Mack and Zie, both 7, were named for his nephew, Mackenzie. Zie won’t enter the barn before Mack, who ranks higher. If Lemieux tried to force the issue, there would be trouble, he said. The older two are more shy of people, because they spent the first few years of their life with Lemieux’s father, a rough handler. Lemieux himself had more of a hand in the raising of the younger team, and so they are friendlier and enjoy being pet under their manes along the neck. He patted Zie, rubbing his hand along the thickening black winter growth of hair. “He’s at the bottom of the tank, but he’s my friendliest guy,” he said. Tinoir is the top horse right now. When Lemieux spreads hay on the ground, even though there is plenty for all of them, Tinoir bites and kicks the others, keeping them at bay for about 10 minutes. But Mack has been pushing the boundaries lately, which makes the Lemieuxes suspect he will assert himself as leader of the group one day. “We don’t get involved in that,” Lemieux said. Looking across the barn, a litter of dogs, chickens, baby chicks and horses, he smiled. Lemieux dreams of a day when he can lay down his mason tools for good and take up driving horses full time. For now, it’s something he can focus on in the winter, when the masonry season is all but dead. So far, the business has done little more than break even. That’s not counting the cost of the horses’ upkeep, which Lemieux said amounts to a total of about $2,000 a year, even though he trims and shoes them himself and grows his own hay. In order to expand, Lemieux has diversified. In addition to sleigh rides, the Lemieuxes offer wedding carriage rides and wagon rides, charging about $550 for a local wedding or a six-hour day of wagon rides. They also plan to offer more and different kinds of rides on their property. Next year, they might add a campfire experience in the woods for an added fee. Later this year, they plan to offer a horse-drawn tour of a different type of Maine traditional operation, maple sugaring. They’ll offer a 15-minute sugarbush tour of the woods, showing off a traditional operation with buckets instead of tubes on 500 tree-taps and a wood-fired evaporator. The horses will also play a role in the actual work, dragging the collection tank as the sap is collected in buckets. 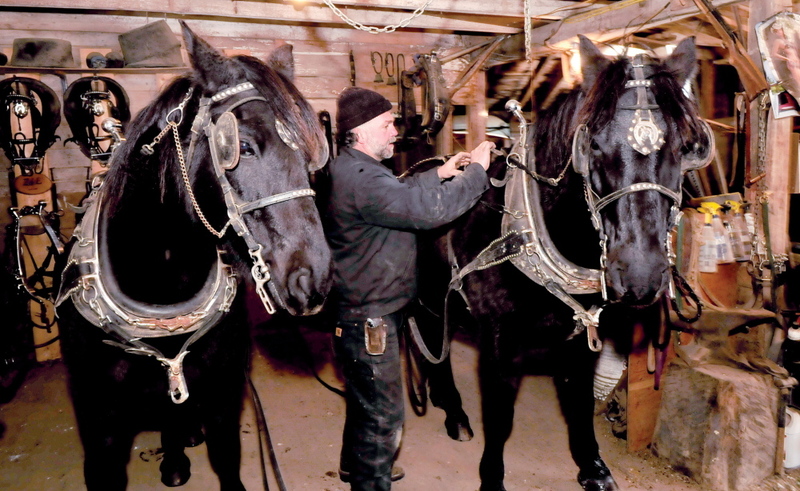 Maine has fewer horses, fewer sleighs, and fewer men like Lemieux, who have the desire and skills necessary to keep a horse driving operation going. But for now at least, with the Lemieuxes determined to make a go of it, there will be at least one place in central Maine where people can experience a Christmas classic.